Harry R. Anderson, 92, who was Assistant Secretary of the Interior from 1965 to 1969, died of congestive heart failure December 2, 2002, at the Arleigh Burke Pavilion in McLean, Virginia. He lived in Alexandria from 1965 until moving to the retirement facility earlier this year. Mr. Anderson was a career public servant and an administrator in California when he was tapped by President Lyndon B. Johnson to be the executive responsible for the Bureau of Land Management and the Bureau of Indian Affairs. In the early 1970s, he was an administrative aide to Rep. Glenn Anderson (D-California). They were not related. 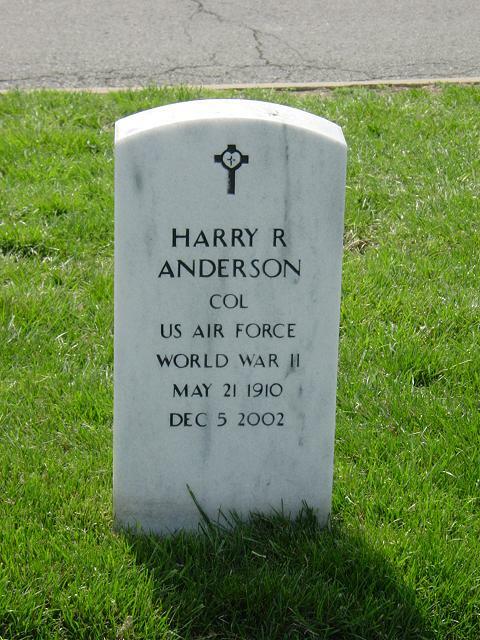 Mr. Anderson, a native of Hilmar, California, was a graduate of the University of California, Berkeley. During World War II, he served as an intelligence officer with the Army Air Force in Europe. He retired as a Colonel from the California Air National Guard. Among his decorations was the Legion of Merit. He was a member of the Army Navy Country Club, the National Press Club and the Freemasons. Survivors include his wife of 61 years, Merle K. Anderson, and their daughter, Bettina Sims, both of Alexandria; and a grandson. On Thursday, December 5, 2002 at Arleigh Burke Pavillon after a long illness. He was born in Hilmar, California. A 1934 graduate of the University of California in Berkeley, he worked in state government under five governors. In 1964 he moved to Washington and served until 1969 as Assistant Secretary of the Interior for Public Land Management. A World War II veteran in the European Theatre from 1942 to 1946, he later retired as a Colonel in the Air National Guard. He had a lifelong interest in California agriculture and maintained a ranch in Sutter County. He was a 50 year Mason, member of the Army Navy Country Club and National Press Club. Survived by his wife, Merle K.; daughter, Bettina and son-in-law, Stephen Sims; cherished grandson, Christopher J. Sims, and a host of friends. Burial with full Military honors will be at Arlington National Cemetery on January 7, 2003, at 3 p.m. In lieu of flowers donations may be made to the Northern California Shriners Hospital for Children, 2425 Stockton Blvd., Sacremento, California 95817.